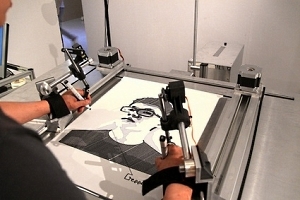 The Self Portrait Machine is a gadget that forces you to draw yourself. The unit has a camera which captures a picture of yourself and when ready to proceed you put your hand in to some straps, grab a pen and you are then forced to draw a picture of the photo just taken. I found some the relationship between human and machine are amazing and could be horrible (like this one that shows how we human invent machines then put human inside to it to manufacture goods), The final object – A machine is a miniature of what I understand through the process of research, and the aim of the machine is to let people have a chance to feel the condensed process of how we generate our self identity from external point of view as from the society, which is a big machine we all in.